A wedding scrapbook filled with your favourite instax memories is one of the best ways to cherish the most important day of your life. Although wedding planning can be filled with stressful choices and tough decisions (aka turning into a bridezilla), creating an instax scrapbook is a fun and easy way to get your loved ones involved. You can’t go wrong by using an instax camera at your wedding to create a beautiful and useful scrapbook for everyone to enjoy. Preserve your sentimental wedding story in a unique scrapbook that you can pass on to future generations. Take a trip to your local crafts store where you will find endless amounts of tools and techniques to use as you plan the look and feel of your personalised scrapbook. We recommend starting out with the essentials, such as yarn, tape, multi-colored stock paper, coloured pencils and watercolors. Consider making your scrapbook the same color scheme as your wedding to add an extra-special touch. Memories can fade over time, but do you know what lasts longer? 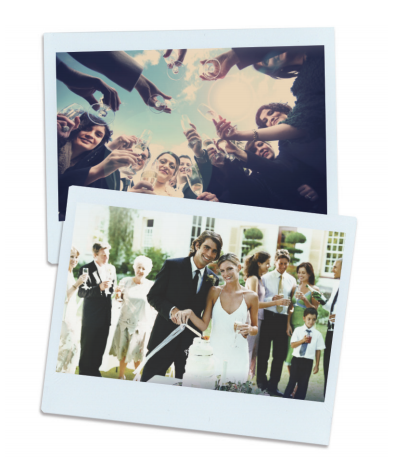 Clear, glossy instax photos of your most cherished wedding moments. Think about all the instant wedding photo fun you can share from the moment you take the photo to years in the future. With an instax scrapbook, you, your spouse and all of your guests can look back to revisit this special day together for years to come. Place colourful pens, tape, a scrapbook (with lots of pages) and your instax camera on a table. Leave a note on the table instructing your guests to take a fabulous selfie. 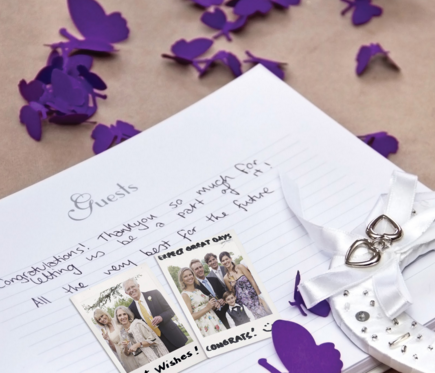 When the instant photo prints from the camera (or instax SHARE printer), have your guests tape the photo to the scrapbook and write a special note next to the instant photo. Afterward, enjoy re-reading the sweet thoughts and silly comments on the image captions. The scrapbook will help remind you how thankful you are for all your loved ones who helped contribute to the many aspects of your wedding day. Looking back at instax photos of the ceremony, speeches, cake cutting and reception, you might feel overwhelmed with the same happy emotions you carried that very day. Find more instax-themed ideas for your upcoming wedding in our eBook, The Ultimate instax DIY Wedding Guide: 5 Creative Ways to Use instax for Your Big Day.